The recent attack in Barcelona reminded me of a song that I learnt about in Catalan class in college. I’ve translated the song into English, and I’ve “shown my working”, so to speak — there’s a literal translation, which hews as closely to the original Catalan as I can stand, and there’s a less literal translation, which departs from the Catalan in literal meaning, but hopefully expresses the figurative meaning better. They’re not that different, but one shows the structure of Catalan better, and the other is more readable. Even though I’ve written about Catalan a bit, I don’t have a strong grasp of the language, and this translation is consequently a bit shaky. It’s worth remembering that I usually do these translations as a way to learn a language or about language. This isn’t a literary translation, and you can’t really sing the words to the tune. This song is Barcelona, by La Troba Kung-Fu. Enjoy it. Thanks to Elena for helping out with the translation. que no sé si és mora o és gitana. que no sé si és jueva o catalana. però que olora amb pólvora feta de vida. that I don’t know if is Moorish or is gypsy. that I don’t know if is Jewish or Catalan. But that smells of powder made of life. I don’t know if it’s Moorish or gypsy. I don’t know if it’s Jewish or Catalan. But that smells of a perfume full of life. As a Mediterranean port, Barcelona has been a place of interchange for centuries. The narrator of the song hears a voice with streaks of the various cultural identities that have passed through Barcelona through the ages: Muslim, Gypsy, Jewish, and of course Catalan. Sorry, “powder” just isn’t a very evocative word, so I had to do something to it. o bé arribar-me a la Reial. que plora pels carrers de Barcelona. and turn through Hospital Street. Or go to the (Plaza) Royal. that cries through the streets of Barcelona. and turn down Hospital Street. La Rambla, Carrer de l’Hospital, El Raval and Plaça Reial are all smack in the city centre, and they’re all tourist hotspots. This Barcelona is the Barcelona that most tourists know. If you’re a fan of flags (perhaps you are a Hello Internet listener? ), though, you might know that in vexillology, a canton is the upper left corner or quarter or region of a flag… and there you have the semantic link between Catalan “cantonada”, street corner, and the Swiss political division of a canton. There’s a lot to be found down this particular rabbit hole, but I’m going to move on. If you’re curious, though, I suggest you look up the etymology of “cant”, as in “decanter” or “canted angle”. If I knew more about Proto-Indo-European declension, I would be able to tell you if you could etymologically make your way from “canton” to “camera”, but I don’t. si faig el camí del turista. “Vine, perde't pels carrers de Barcelona". “Vine, deixa la por, perd la vergonya!". Always by the narrow path. If I do the tourist’s walk. Always down the road less travelled. If I see only the tourists’ sights. For the first time in this song, a line is drawn between the touristy Barcelona and the “real” Barcelona. “Cap” is an interesting word in Catalan. It can be a noun meaning “head” — in fact, it is cognate with English “head”: both words ultimately descend from Proto-Indo-European *káput. PIE *káput became Proto-Germanic *haubadam, then Old English *heofod, and eventually Modern English “head”. The Catalan lineage runs from PIE *káput to Proto-Italic *kaput, to Latin “caput”, and eventually to Catalan “cap”. Anyway, back to the point — “cap” can be the noun “head”, or it can be a preposition meaning “towards”, or it can be used as a pronoun or adjective that means “nothing” or “none” (to put it simply — maybe one day I’ll dig into this a bit more.) I can see how the prepositional meaning of “towards” might have come about — when you’re going in a certain direction, you’re pointing your head that way — but I have no idea how the “nothing”/“none”/negation meaning came about. i on el cau no han foradat. And where they have not penetrated the hideout. The way a Gypsy dances. I’m really shaky on this verse, and I’m happy to welcome explanations or alternative translations. I’m especially unsure about the first four lines (which you can probably tell by how different the two translations are). Catalan “cau” is cognate with English “cave”, both of them being descended from Latin “cavus” (hollow). In Catalan, “cau” has acquired the meaning of a den, refuge or hideout (which you do see in English, too — consider “mancave” or “batcave”). pels de fora es posa guapa. jo la busco i ella s'amaga. From street corner to street corner. For those from outside she makes herself pretty. I’m looking for her and she’s hiding. From corner to street corner. For the tourists she cleans up. I’m looking for her but she’s hiding. That’s the voice the narrator hears inside him/her, if you can’t tell. The narrator wants to find the real Barcelona, not the touristy one, but she seems elusive. The pun on clean up is fully intended, albeit admittedly not very good. There are many different ways to express that idea — Barcelona dresses up, Barcelona puts on a show, Barcelona puts on a pretty face for outsiders. com camela quan remena, Barcelona. Like sweet talk when she stirs, Barcelona. Just like sweet talk, when she stirs, Barcelona. I love this song because it captures the complexity of Barcelona so well — it’s a city with a storied history and many faces. I don’t really know how to end this post, except to say… I guess I want to say that language is a big part of how we transmit ideas and culture. The act of translation is not about translating syntax and words, but about translating ideas and cultures. This is my small contribution to a world riven by walls and division: an exploration of one thing, language, that has the capacity to connect us to one another. This is Part 10 of a series covering the basics of articulatory phonetics, the study of how humans physically produce speech sounds. For the full list of posts, see the Articulatory Phonetics 101 Index. What’s the difference between vowels and consonants? For now, I’m going to give you an answer that might sound quite lame or unsatisfactory. Remember that consonants are formed by creating an obstruction or constriction in the airflow in the vocal tract. Well, vowels are produced with an open vocal tract. It’s open in the sense in that there is no obstruction, no closure or turbulence in the vocal tract. Yeah, I know what you’re thinking. What about approximants like /j/ and /w/? There’s no closure or turbulence there, either. Well, the answer is that approximants create more of a constriction in the vocal tract than vowels do. That’s it. Or at least that’s our working definition. Okay, so now we’ve decided what vowels are. Next question: How do we distinguish one vowel from another? I mean, /i/ (as in “feet”), /ɑ/ (as in “fart”), /u/ (as in “food”) are all vowels, but they’re all different vowels. What makes one vowel different from another? Well — here, I’m going to give a technically incorrect but still very useful definition. We’re going to define vowels based on the highest point of the tongue. So, in /ɑ/, the tongue is low, and the highest point is pretty far back in the vocal tract. In /æ/, the highest point of the tongue is still low, but now it’s much further forward. 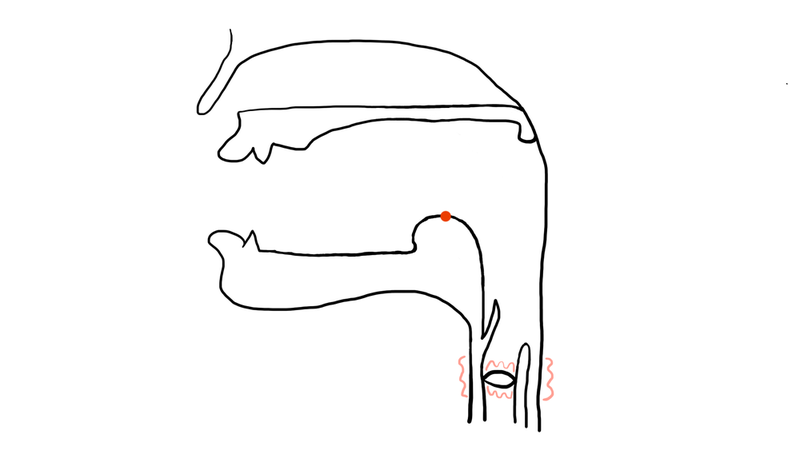 In /u/, the highest point of the tongue is way up there, and it’s at the back of the vocal tract. And finally, in /i/, the highest point of the tongue is high up here and it’s far forward, almost touching the palate. Now, we have two axes here: vowel height and vowel backness. Vowel height is how high the highest point of the tongue is, and vowel backness is how far back the highest point of the tongue is. (A quick but necessary aside for readers with a prior background in linguistics, who may disagree with the choice of low front vowel: Why /æ/ and not /a/ for low front, as the IPA chart suggests? See Ladefoged and Johnson, A Course in Phonetics, 6th Edition (Boston: Wadsworth Cengage, 2010): /æ/ is a little higher and fronter, /a/ is a little lower and backer. The vowel quadrilateral is an abstraction. What goes in the low front position that best fits our model? It seems to me that if you want to emphasise the frontness of the low front vowel, that spot should go to /æ/, and /a/ should be considered a low central vowel. If you want to emphasise the lowness of the low front vowel, then the low front vowel should be /a/ and /æ/ is raised (and fronted) relative to /a/. Try this: say these vowels aloud. /ɑ/ as in “father”, /ɔ/ as in “all”, /o/ as in “pole”, /ʊ/ as in “pull”, /u/ as in “pool”. Do you feel the back of your tongue rising towards the top of your mouth? These are all back vowels, but they vary in height. /ɑ/ is a low back vowel, /ɔ/ is a low-mid back vowel, /o/ is a high-mid back vowel, /ʊ/ is a high back lax vowel, /u/ is a high back tense vowel. “Well, technically, that’s not the whole story…” — don’t yell at me, I’m trying to keep things simple. You might also notice that your mouth went from mostly open to mostly closed, so for this reason we sometimes use “open” and “close” to refer to vowel height — but as far as we’re concerned here, we’ll stick with high and low. /æ/ as in “sat”, /ɛ/ as in “set”, /e/ as in “cake”, /ɪ/ as in “sit”, /i/ as in “seat”. /æ/, the low front vowel, /ɛ/, the low-mid front vowel, /e/, the high-mid front vowel, /ɪ/, the high front lax vowel, /i/, the high front tense vowel. These aren’t all the vowels, though: we also have mid vowels, which are neither high nor low, and central vowels, which are neither front nor back. Then, there’s the vowel in “bird”. Depending on how you speak, this is either a /bɜd/ (if the vowel has no r-like sound) or a /bɝd/ (if the vowel has an r-like sound). The little squiggle in /ɝ/ indicates that it’s an r-coloured vowel, or rhotacised vowel. For our purposes, we’re going to consider /ɜ/ a mid central vowel. Okay — now, let’s take a look at the final vowel in “father”. It sounds the same as the vowel in “bird”, but it occurs in an unstressed syllable. For reasons we’re not going to go into in great detail right now, this unstressed vowel, also a mid central vowel, has a different symbol: /ə/, or /ɚ/, depending on whether your vowel is rhotacised or not. Now, of these central vowels, it’s worth pointing out that many, maybe most native English speakers won’t use all four of these vowels. Received Pronunciation, or the so-called “BBC English”, doesn’t have /ɝ/ and /ɚ/, and General American doesn’t have /ɜ/. But no matter what variety of English you speak, you will have the vowel /ə/, which is the single most common vowel in the English language. This is the mid central vowel, better known as the schwa. The schwa is the vowel produced when the vocal tract is in a completely relaxed position. Well, what’s the difference between /ɜ/ and /ə/, or between /ɝ/ and /ɚ/? It’s simple: if the vowel is stressed, we call it /ɜ/ or /ɝ/, and if it’s unstressed, we call it /ə/ or /ɚ/ (depending on the word and on your dialect, of course). Now, the reasons for this have more to do with phonology than with phonetics per se, so we’ll leave it at that. We’re almost — almost — done with vowels, but there’s one more thing we need to talk about. You might have noticed that when you said /ɑ ɔ o ʊ u/, your lips ended up sort of rounded and puckered, while the front vowels /æ ɛ e ɪ i/ didn’t have the same effect. Well, in most languages, back vowels tend to be rounded, while front vowels tend to be unrounded, but that is only a tendency. If you speak French or Dutch or German or Mandarin, you might be wondering about the vowel /y/, which in French and Dutch is written <u>, and in German as <ü>, and in Mandarin Hanyupinyin romanisation as either <u> or <ü>. That is a high front rounded vowel. If you say /i/ and round the lips, you get /y/. This vowel exists in tense and lax forms as well, and they’re written /y/ and /ʏ/ in IPA respectively. When you’re writing IPA symbols on a vowel quadrilateral, the symbol for the unrounded vowel always goes on the left, and the symbol for the rounded vowel on the right. Similarly, there’s no reason the back vowels need to be rounded. You can take /u/, and without moving the tongue, relax the lips, so that they become unrounded, and that’s the high back unrounded vowel /ɯ/. You can take /o/, and again without moving the tongue, unround the lips to get /ɤ/, which is a vowel that exists in Mandarin: that’s the vowel in 喝 hē, “to drink”. Okay, I lied — let’s squeeze in one more thing. If you’ve ever tried to learn French or Portuguese, you might have heard of nasal vowels. In French, <bien> isn’t pronounced /bjen/ as it is in Spanish; it’s instead pronounced /biõ/, with no /n/ at the end of the syllable. Well — in a nasal vowel, the velum is lowered, which allows air to escape through both the nose and the mouth, and that’s what makes nasal vowels sound different. Nasal vowels aren’t indicated on the vowel quadrilateral. Instead, in order to indicate a nasal vowel, we draw a tilde ~ above the vowel. Whew. That’s all for now — if you made it through this post, you now know the basics of how vowels are articulated. In the next post, we’ll look at vowel sounds like “eye” /aɪ/, “ow” /aʊ/, and “oi” /ɔɪ/, and how they’re different from the ones we’ve seen so far. This is Part 9 of a series covering the basics of articulatory phonetics, the study of how humans physically produce speech sounds. For the full list of posts, see the Articulatory Phonetics 101 Index. There will eventually be a video for this post, once I figure out how to produce the videos in a way that isn’t terrible. The physical production of a speech sound begins with an intake of breath. You may have heard of the click consonants of languages like !Xhosa, or maybe the ejective consonants of Georgian, or the implosive consonants of Sindhi. With clicks, ejectives and implosives, the air flows differently through the vocal tract. These consonants have a different airstream mechanism. With all the consonants we’ve been studying, all the consonants of English, the airflow starts with increased air pressure in the lungs forcing air outwards through the vocal tract. This is the pulmonic egressive airstream mechanism: it’s the diaphragm and the lungs that drive the movement of the airstream, and the air moves out of the vocal tract. Hence: pulmonic egressive. Now, let’s look at click consonants. Listen to this sound, and try to copy it. Got it? This “tsk” sound is probably a sound you’ve made before, but you might not have known that it’s a speech sound in other languages. (I’m assuming you’re primarily an English speaker, of course.) This is the dental click. Let’s examine what happens here. Now, when you start to make the sound, two things happen simultaneously. The back of your tongue rises up to touch the velum, and at the same time, the tongue tip rises up to touch the back of the teeth. We’ve now formed a closure in not one, but two places: one at the velum, one at the teeth. Now we have a little pocket of air between the palate and the tongue. Next, what happens is, we lower the tongue just slightly, without moving the two closures at the velum and the teeth, so the air pressure in the air pocket drops. Then, we release the dental closure, and air rushes into the mouth to fill the low-pressure space. That’s what happens when you produce a click. Because this airstream mechanism is initiated by the tongue, it is a lingual mechanism (from the Latin word “lingua”, meaning “tongue”), and because air is drawn into the vocal tract rather than being forced out of it, we call it an ingressive airstream. The airstream mechanism of click consonants, therefore, is called the lingual ingressive airstream mechanism. They don’t have to just be dental, either — they can be bilabial, alveolar, alveolar lateral, or palatal as well. What about ejectives like /k’/? Well, try it — can you copy the sound you’re hearing? What is happening here is that first, you’re closing your glottis to form a glottal stop, and at the same time you raise the back of the tongue to touch the velum, forming a velar closure. Now, we have a pocket of air in the pharynx. You see where this is going! The next step is to raise the glottis. This increases the air pressure in the air pocket. Then, you release the velar closure, and the compressed air is released out of the vocal tract — pretty forcefully! The airstream is initiated at the glottis and pushes air out of the vocal tract, so we call it the glottalic egressive airstream mechanism. To indicate that a consonant is ejective, we mark it with an apostrophe, as in /k’/. One more — implosives like /ɓ/. If you don’t speak a language that has implosives, they might not seem very remarkable to you — like a slightly different-sounding stop. However, about 13% of the world’s languages have contrastive implosive consonants (source: Wikipedia), so we definitely need to examine them closely. The articulation of an implosive consonant starts like that of an ejective: there’s a closure at the glottis and at the point of articulation — in this case, the lips. Now, we have the same air pocket as we did with ejectives. But this time, instead of raising the glottis, we lower it. This reduces the air pressure in the oral cavity, and then, when we release the bilabial closure (which is how linguists say “opening the mouth”), air is pulled into the vocal tract. This is — you guessed it — the glottalic ingressive airstream mechanism. There are only a limited number of consonants that can be produced this way, and the ones with an IPA symbol are the voiced bilabial /ɓ/, dental /ɗ̪/, alveolar /ɗ/, palatal /ʄ/, velar /ɠ/ and uvular /ʛ/implosives. These are the four airstream mechanisms found in the world’s languages. We do use other airstream mechanisms to communicate — for example, a gasp is a pulmonic ingressive airstream mechanism — but crucially, these four are the ones we use to produce speech. And there you have it — a brief introduction to airstream mechanisms. So, we’re finally done with the articulation of consonants, and in the next post, we’ll be looking at vowels. Thanks for reading! See you next time.